For some holes, like the 7th at Pebble Beach, forgetting a camera is not an option. The PGA Tour continues its West Coast swing this week as it heads to iconic Pebble Beach Golf Links for the AT&T Pebble Beach Pro-Am. The first three rounds are rotated through Pebble Beach, Spyglass Hill Golf Course, and Monterey Peninsula Country Club, the final round of the pro-am is solely played at Pebble Beach. This will be the first of two trips this year for the Tour to the 100-year-old course, as it will play host to the U.S. Open this June. Here's everything that you need to know about Pebble Beach, which has played host to its own pro-am for over 70 years. Course origin: Developer Samuel F.B. Morse was challenged with making Pebble Beach an attractive real estate investment. Morse believed that the development of a golf course along the rugged coastline would attract people to the south side of the Monterey Peninsula. So, in 1919, Morse assigned amateur course designers Jack Neville and Douglas Grant to build the course. Despite very little experience designing courses, Neville and Grant put together a track that has had to undergo only minor renovations. Its official coming out party was in 1929 when it hosted its first U.S. Amateur, which featured the likes of Bobby Jones. Course design: When the course was originally designed, Neville and Grant's goal was to place as many holes as possible along Carmel Bay. The course, which features dramatic views of the Pacific Ocean, runs 7,040 yards and has four tees for golfers to use (blue, gold, white, and red). While the fairways are made from winter ryegrass, the greens use poa annua grass. The course has undergone only a handful of renovations, but its most recent redesign came before the 2010 U.S. Open. Led by Arnold Palmer, four greens and 16 bunkers were rebuilt, altered, or installed, 11 tees were enhanced, trees were added or adjusted on six greens, and the course distance was lengthened. The history of the pro-am at Pebble Beach: The Pebble Beach Pro-Am was once known as the Bing Crosby National Pro-Am and has been played at Pebble Beach since 1947. Nicknamed the Crosby Clambake, the event was renamed as the AT&T Pebble Beach Pro-Am in 1986 after the late singer and actor passed away and his family stopped hosting. The history of the U.S. Open at Pebble Beach: The course hosted its first U.S. Open in 1972 when Jack Nicklaus won his third U.S. Open title. The course has since hosted the national championship four more times in 1982, 1992, 2000, and 2010. It will host the U.S. Open for the sixth time this June and for the seventh time in 2027. Other big events at Pebble Beach: The U.S. Amateur has been played at Pebble Beach five times, most recently this past year. Between its first in 1929 and most recent in 2018, Pebble Beach has hosted the U.S. Amateur in 1947, 1961, and 1999. Meanwhile, the PGA Championship has been hosted only once at Pebble Beach back in 1977 when Lanny Wadkins won the only major of his career. Longest hole: The par-5 14th hole runs 572 yards from the furthest tees and plays as the number one handicap. The dogleg right is a three-shot hole for almost all golfers. The well-placed bunker to the right of the fairway can capture shots that are aimed at cutting the dogleg. Golfers should use as much club as possible on their second shot. If the pin is tucked upper left, players are advised to take one extra club to carry the bunker in front of the green. Shortest (and most iconic!) 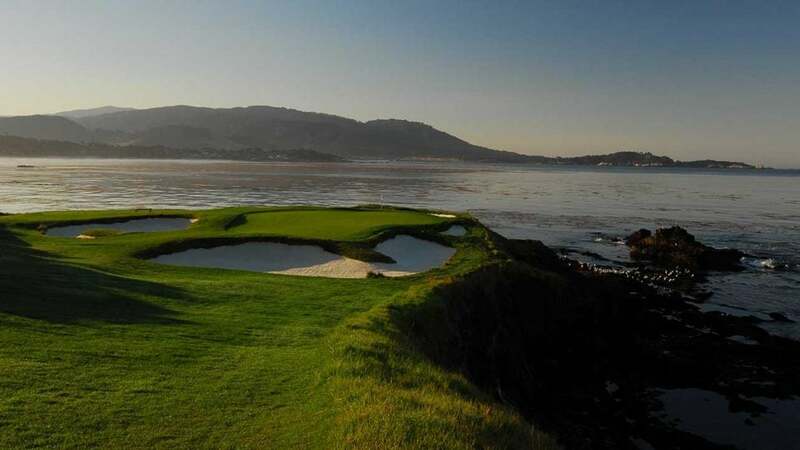 hole: The debate over what Pebble Beach's most iconic hole is can get heated, but luckily enough, one of them happens to be the shortest hole on the course. The par-3 7th hole, which runs 106 yards from the furthest tees, is in fact the shortest hole on the PGA Tour and plays as the number 18 handicap. Situated on Arrowhead Point, the wind can get crazy at the 7th hole. As a result, club selection is dependent upon how strong the wind is. Sam Snead once opted to putt off the tee and down a dirt cart path instead of sending a shot airborne into the crazy wind. Golfers are advised to try a knockdown shot, keep the ball from going into the wind, and play it safe to the middle of the green.